Weekly Famitsu magazine came with a Sengoku Basara 4 Sumeragi supplement this week which collected all of the previous coverage to date. In addition, there was a 9-page feature article with a few more interesting details about the game. The article only confirms one boss per stage (even though we already know there are two on one of the other stages featured) so I've added logical assumptions for sub-bosses in my table above. There are also short descriptions. Once in a Lifetime: An encounter with Sen No Rikyuu, who is fleeing from the Toyotomi army on suspicion of trying to assassinate Hideyoshi. Break through the powerful attacks from Wabisuke and Sabisuke. Azure-Crimson and the Demon King: In the blaze of Honnouji, Masamune and Yukimura challenge the Demon King, Oda Nobunaga. Intruding upon the dangerous battlefield with these three warriors, defeat them all and become the true victor! The Two Arms of the Toyotomi: Ieyasu confronts the player as a member of the Toyotomi army, together with Toyotomi Hideyoshi and Ishida Mitsunari! 42. Weapons exist to make the warriors' abilities stronger! The main news in this section is the formal reveal of the Personal Inscriptions we've known about for a while. It includes descriptions of some of the effects. A few more miscellaneous medal rewards are also confirmed. Naotora's alternate hairstyle costume is called the Ii-style Maiden Hairstyle. Muneshige's Jumbo Xavi-kun Ver. costume is coming back - for Sourin this time. Tadakatsu is getting a Defence Mode Ver. costume with shields. Magoichi's skill revision shows the full version of her (very nice) medal costume. Magoichi causes an explosion by firing a grenade. It can be used as a ranged attack. They've only talked about the six major tie-in DLC costumes up until now but there's much more planned. The first goodies will be available from the Japanese PSN store tomorrow! They have also confirmed the availability for the six major tie-in campaign costumes, for those who want to buy the costumes they like from PSN rather than getting the full set with the special edition of the game. The bad news is that it looks as though they're only available in bundles for now. The eight characters featured in the PS3 avatars and themes are the newly-playable characters. Everyone else already got avatars and themes when Sengoku Basara 4 came out. I'm not sure about the full details for the two 'weapons with inscriptions' sets. Perhaps the large one contains enough weapons for all of the characters? The article also confirms that the DLC costumes from Sengoku Basara 4 will be available too. If you already bought costumes for Sengoku Basara 4, you can download them again for free. 44. The design of the Sengoku Basara 4 21 Costume Hobby Box is revealed! This is already on display on the official website so this news item isn't very interesting. Your character levels, weapons, inscriptions and costumes. All types of Play Books. Your Sengoku Creation Mode progress (however, the status of partially finished campaigns will not be transferred, so finish any story modes which you haven't completed first if you don't want to lose that progress). Stages that you have unlocked in Free Battle Mode. The article doesn't mention it but a previous report also noted that unlocked difficulty levels will also be included. As previously stated, the content which is specifically not going to be included in the save data import is your accumulated money, unused experience points and consumable weapon upgrade items. The consumables will be converted to Tenka Medals. The additional reward for transferring your Sengoku Basara 4 save is that you will start with some skill revisions already unlocked right from the start without having to buy them with Tenka Medals. The number of skills will depend on the state of your save data. All of this will be posted on the official website shortly along with proper instructions; the magazine article is just giving fans a head start. I already posted all about this here. 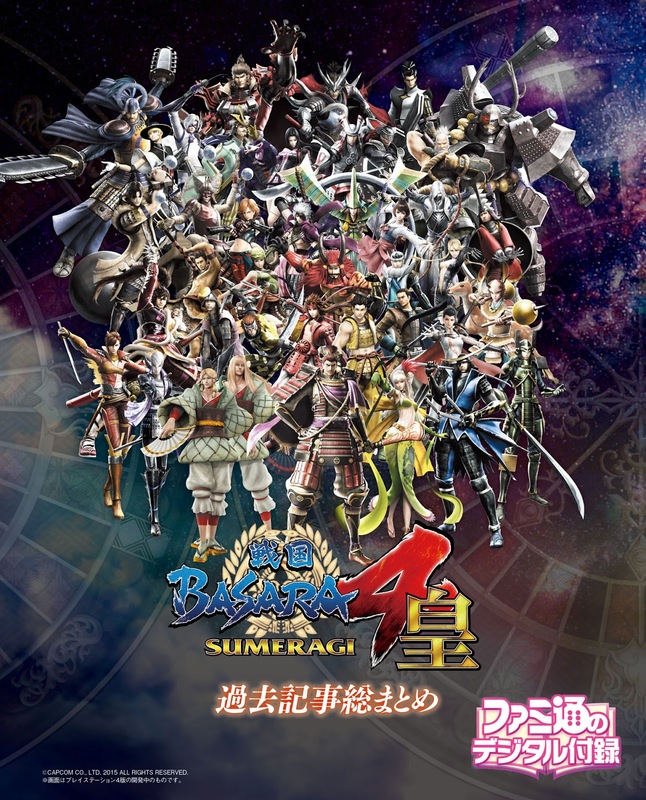 The PS3 version of Sengoku Basara 4 Sumeragi is currently ranked in 35th place in the magazine's chart of most wanted upcoming games. There will be another big 12-page feature in next week's issue to celebrate the game's launch, as well as a DLC code for Maria's 'Cat paws to suit the lovely me' weapon. It's described as a unique weapon which can send enemies flying with paws - like a rocket punch. It also changes her element from wind to light. Maria is wearing cute cat ears in the pictures. Thanks for noting the magazine tie-in DLCs! I'll keep an eye out for them on Bookwalker. Having Bookwalker providing at least two of the new DLCs is great, much easier (and cheaper) for people outside Japan! I wonder if DLC-stuff is a cross-buy for both consoles. I mean They're saying you could transfer your DLC from vanilla to PS4. If this includes all the DLC that was bought previously why wouldn't it include the new one as well? Anyway I'm looking forward to check how this works as I'm purchasing both versions of the game but only one of these is packed with DLC costumes. I posted this very message before and it went to Dengeki Playstation Sacon's DLC weapon comments. But as i deleted it recent comments section says it was right here in the right topic. And same thing happened before on different occasion I recall. What the hell? Lol. I have no idea what's happening with Blogger's comments but it's ok to leave comments on the wrong post (lol). The DLC seems to be cross-buy (other than the themes/avatars, of course) which is useful. I would guess that once you activate the costume bundle on your PSN account, you'll be able to download the full set via PSN on your other PlayStation too. Say raindrops, can i preorder the game through the asian PSN? I can't see it either. They've added the new avatars and themes so it must be coming soon; perhaps the Asian stores are only going to add it on release day?